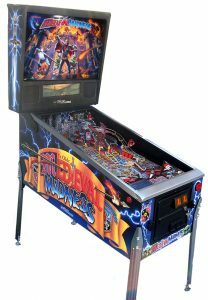 Pincadia now has 21 pinball machines including 5 of the top 7 player rated! Notable Features : Flippers (4), Pop bumpers (3), Ramps (2), Dual left inlanes, “Rocket” kicker. Dual autoplunger/manual plunger arrangement. Maximum 1 buy-in ball per player (operator option). 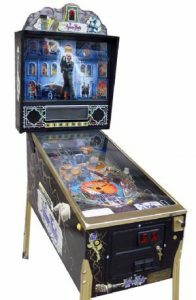 Notable Features : Flippers (2), Pop bumpers (3), Slingshots (2), Rotating trunk with magnet, Tiger Saw Multiball (2), Trunk Multiball (3), Trunk Multiball w/Vanish Lock (4), Magna save (2), Levitating ball. Maximum 3 buy-in balls per player (operator option). 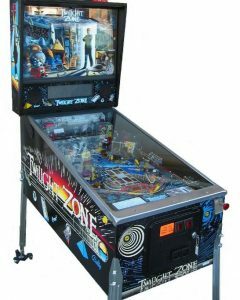 Notable Features : Flippers (3), Pop bumpers (3), Ramps (3), 3-bank standup targets (2), Spinning target (1), Cellar holes (4, with one blocked by a drop target), Left outlane kickback. Catapult used for autoplunger (ball is launched through a spiral habitrail). 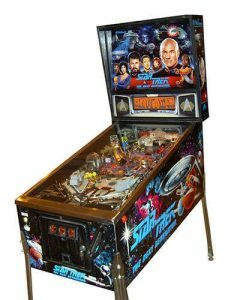 2-, 3-, 4-, or 6-ball multiball. Notable Features : Flippers (2), Pop bumpers (3), Ramps (2), Autoplunger. A left-side catapult propels ball airborne into a habitrail. Two pop-up trolls in playfield become active during “Trolls!” mode. 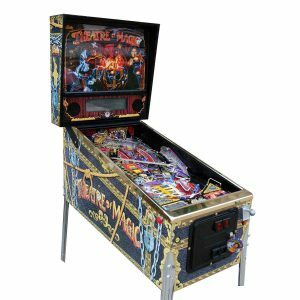 Even more pinball at Pincadia!